Austin’s landmark for upscale interior Mexico cuisine. : In this striking hacienda, lush with towering foliage and Latin American art, you'll experience authentic interior Mexican cuisine. An Austin landmark since 1975, Fonda San Miguel is equally treasured by locals and foodie tourists. A mandatory appetizer is the queso asado (baked cheese) with smoky poblano strips and pork chorizo made in house with Swiss chard. We also like such regional classics as the dark, deep-flavored mole poblano, with a sauce balanced by toasted chilies and unsweetened chocolate, or the Yucatan specialty of cochinita pibil --- pulled pork baked in a banana leaf. 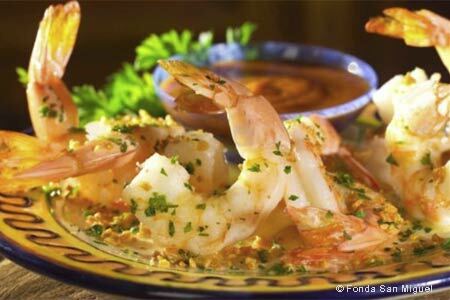 Seafood hits include the camarones adobados, chile-crusted Gulf shrimp and poblanos in a chipotle-black bean sauce served atop handmade corn tortillas. There’s a wine list for perusing; a refreshing Peruvian pisco is also among the libations. Fonda San Miguel’s Sunday brunch is a lavish spread, accompanied by polished service and first-rate margaritas.